The holy month of Ramadan 2016 has begun the world over. The beginning itself was a celebration in the city of Istanbul where streets usually have late nights. 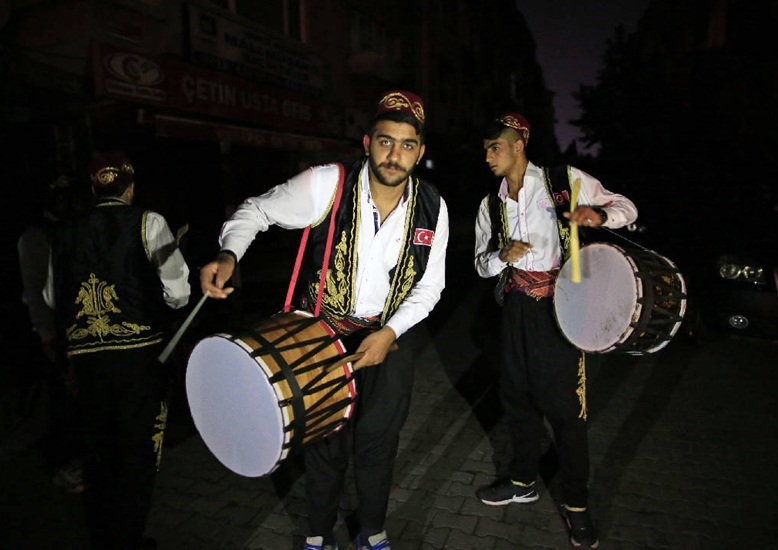 With the dawning of Ramadan in the dead of night, a group of drummers hit the streets of Istanbul and broke the silence of neighborhoods with drumbeats. It is a traditional phenomenon to welcome the season of festive fasting and holy prayers for the Muslim community here. That’s how life is in Istanbul during Ramadan. Ali Buldu, a 55-year-old drummer, has been abiding by this tradition of beating drums to mark the beginning of Ramadan for half of his life. Decked in traditional Ottoman attire, Ali roams the streets and makes pre-dawn Ramadan rounds every year, which he inherited from his forefathers and which he is passing on to the next generation. Istanbul’s neighborhoods wake up to drumbeats by about 2000 drummers and get ready for ‘Sahur’ – the first meal (breakfast) of the day eaten before sunrise. The drummers roam the streets and wake up people for ‘Sahur.’ The Ramadan breakfast consists of dates and pastries including baklava in Istanbul. The traditional act of beating drums dates back to the Ottoman era of Turkey, according to Ali Buldu. He says with pride, “A special group of Ramadan drummers has been into existence since the beginning of the Ottoman Empire in 1299,” while patting his 23-year-old nephew who joins him in this ritual. Playing drums at weddings and on other festive occasions is the main source of living for Ali and other drummers. This is the way they make their ends meet throughout the year. As weddings are not held in the month of Ramadan, they live on the generosity of people for survival. They thankfully accept tips from those who willingly give. Veteran drummer Ali is afraid that the age-old tradition will gradually disappear in the coming years because today’s young men are not interested in carrying this task for their generation. He worries that ceremonious drumbeats will be replaced by unpleasant sound of alarm clocks. However, the Ramadan drummers were given Ottoman costumes five years ago, which has changed people’s perception of them for the better. They have also been recognized with official membership cards, which have helped to put Istanbul’s centuries-old tradition in good books of the current generation.